We spent Christmas week staying with my family on the beach just outside Charleston, South Carolina, and it was lovely. I'd been to Charleston once years ago for my friends' wedding and loved visiting but just scratched the surface of all Charleston has to offer, between the historic downtown, creative food scene, and access to golf and beaches. 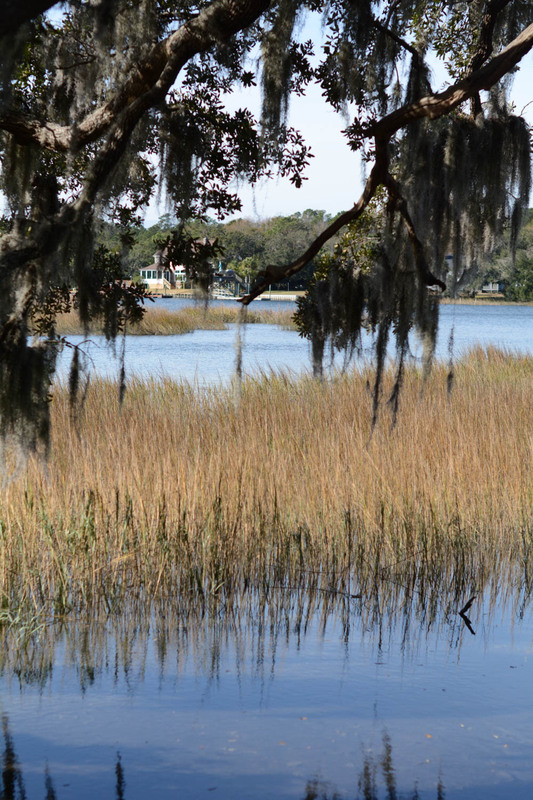 We loved our time in the Lowcountry and can't wait to go back soon! 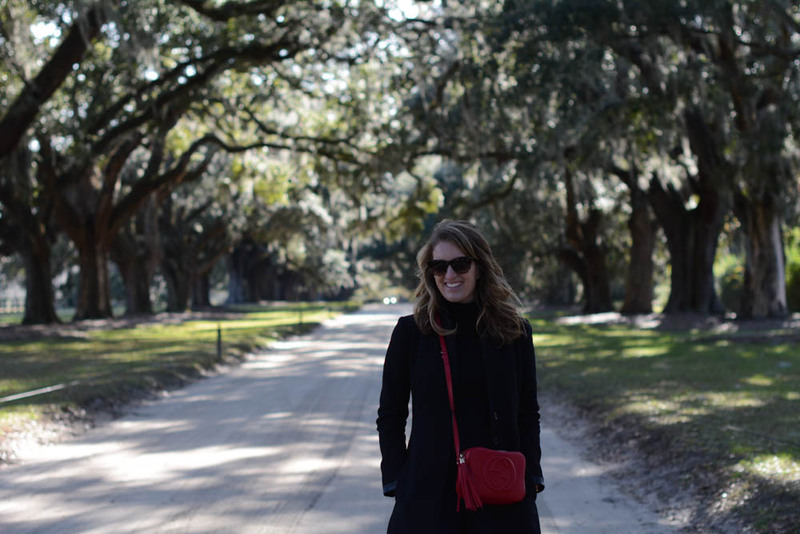 We spent a morning touring the iconic Boone Hall Plantation, which has the most dramatic alleé of Spanish-moss-clad live oaks that I've seen. The grounds and surrounding marshes (below) were beautiful, but the most memorable and impactful part of our visit was the live Gullah Theatre, a presentation on the experience of West African slaves at Boone Hall and other plantations plus the impact of Gullah culture that started under slavery and continues today in the surrounding area. Light rain didn't stop us from enjoying a walking tour of historic downtown with Walks of Charleston. (That's my family seen above, with me all the way on the right in stripes.) The architecture and historic homes are beautiful and so unique, and I appreciated brushing up on both the Revolutionary and Civil War history of the Charleston area. Our gregarious guide tailored the content to our interest (read: lots of restaurant recommendations in addition to history) and had plenty of suggestions for interesting attractions around town. Charleston is known as the Holy City in part because it has the most churches per capita, and indeed church steeples are among the tallest structures of the low-rise cityscape. Let's get straight to the heart of it and talk food. Charleston has an excellent dining scene and I had far more places on my list than we managed to check out. After our walking tour, we feasted at Rodney Scott's BBQ and it was delicious. Seriously so, so good. I could wax poetic about the meats, and the sides, and the banana pudding, but please just trust me here and put it on your list if you're visiting Charleston. We enjoyed a memorable dinner at The Grocery, which had great cocktails and epic large-format dishes that were perfect for sharing amongst a group of our size. I loved the decor, which is warm, understated and unfussy with exposed brick and lots of wood tones. It was cozy enough that it would make a great date spot, but also really relaxed. Clearly I can't say enough good things about it! We had fantastic lunches at Butcher & Bee and Edmund's Oast, which are actually right next to each other and even share parking. Butcher & Bee has creative pastries and Mediterranean-influenced food. Edmund's Oast is part brewery and part restaurant, and we thoroughly enjoyed sitting outside on their covered (and heated!) patio with our dog in tow. Our last night in town with my family we ate at McCrady's Tavern which is warm and cozy and located in a historic space off a quaint alley in the center of downtown. Everything was prepared very well, and yet we still found room for dessert at the end of the meal. They were serving Bûche de Noël - I couldn't say no! One of the neatest things about the Charleston area is the proximity of the town to the beach. We stayed on Isle of Palms, which was an easy 20-30 minutes to town and yet we got to wake up to beautiful beach views every morning. It was really the best of both worlds, and we loved having the option for beach walks, golf, and reading on the deck as well as heading into town for a change of pace. It turns out driving into Charleston wasn't even a requirement to get excellent food in a thoroughly enjoyable atmosphere. Doug and I grabbed lunch at the Obstinate Daughter on Sullivan's Island and I loved it so much that I practically forced my other family members to go there for lunch the next day. We split the Geechie Frites (don't miss these! I still daydream about them), the Frogmore Chowder (a Lowcountry take on a seafood / clam chowder) and the green tomato pizza (seen above, totally yummy). The Obstinate Daughter was sunlit and beachy (without being kitschy) and it I can't remember the last time I had food that good right by the beach. Sunset over Isle of Palms... Swoon. You didn't think I would take a beach vacation and NOT share sunset photos, did you? Never! I can't resist the soft light and pastel washes over the ocean. Lots of homes in the area, including our rental, have rooftop decks that are perfect for capturing these golden hours. We found Charleston and its beaches to be super dog friendly. There were generous off-leash hours and we loved beach walking while Foster would tear up and down the beach at full speed, pausing occasionally to dig (for crabs?!?) and eat mouthfuls of sand despite our protestations. Everyone was super friendly and could not have been more welcoming of visitors. Doug and I extended our trip for two nights (one in Savannah, one back in downtown Charleston) after our time with my family wrapped up. I got to explore the wonderful local shops on King Street, and loved Candlefish and Port Mercantile, which is part of the Restoration Hotel. We celebrated New Year's Eve with friends at the Darling Oyster Bar, which boasts great seafood and would also make an excellent date spot. On New Year's Day, we were up bright and early (thanks, puppy!) and had Rise Coffee Bar (also at the Restoration Hotel) all to ourselves. Rise was speaking my language with their Rosemary Rise, a signature latte with rosemary-infused simple syrup. We met up with our friends for lunch and football Red's Ice House on Shem Creek, which is between downtown Charleston and Isle of Palms on Mount Pleasant. The photo above is our little crew outside Red's - it was a bit blustery but we still had a blast! Stay tuned next week for a recap our quick jaunt to Savannah!